You Must Give Off This Energy With Your Patients. I was recently on a flight to Brisbane and a flight attendant told me I give off great energy. Of course, I was very flattered. A big part of what I do working with Dental Teams is to help them deliver an excellent patient experience and give of great energy with their patients. I call this type of energy, CSE, Customer Service Energy. Does your team give off CSE? My answer is to inspire your team rather than trying to always motivate them. Once your team are inspired to be better then they will become self-motivated. Igniting your team to be an unstoppable force is what you want in your dental business and it is definitely, what your patients want. So how can you bring the best out in your team and inspire them, so they have CSE? Set the expectations of your team, educate your team, appreciation your team and be the very best example for your team. Let your team know what you want and need them to do for your business. Be clear and keep your expectations simple and easy to follow. Ensure your team have the skills and knowledge to achieve the results you expect. Celebrate their performance to ensure further results. Keep a close eye on your team because they are so important to you and you must never forget this! Be proactive in promoting a nurturing a positive work atmosphere. Being the leader means you can lead the way and set the example. Make sure you are have Customer Service Energy yourself. Your team are always be looking at you to lead the way. Be your best, expect the very best from your team and the combination will be amazing. 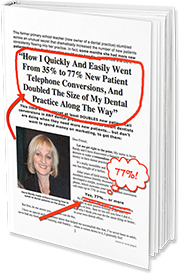 My next public speaking event is my live full day Master Class “How to Turn Every Dental Phone Call Into A Valued and Kept Appointment” and is being held in Brisbane on Thursday 7th June 2018.